According to the listing, by eBay user riggins70chip, this is a one-of-a-kind prototype with a blue and gold face, based on the old-school eagle jerseys. 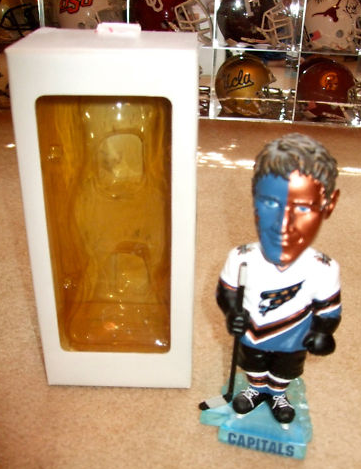 I don’t remember these ever being produced but I do know that the Capitals periodically make prototypes of bobbleheads before they’re mass-produced. Maybe they were thinking about distributing this before the lockout happened. If you have any information on this, let us know. In the meantime, bidding for this item has a reserve price and it’s up to $22.72 as of this writing, so good luck nabbing it. Update: According to a commenter, Jaromir Jagr and Peter Bondra each had a bobblehead made in this style, so it’s probable this one featured was the prototype for those. Typically they’ll make a few, not just one, but this predates my current Capitals bobblehead contact. Read more about Capitals Bobbleheads and follow us on Twitter and like our Facebook page.